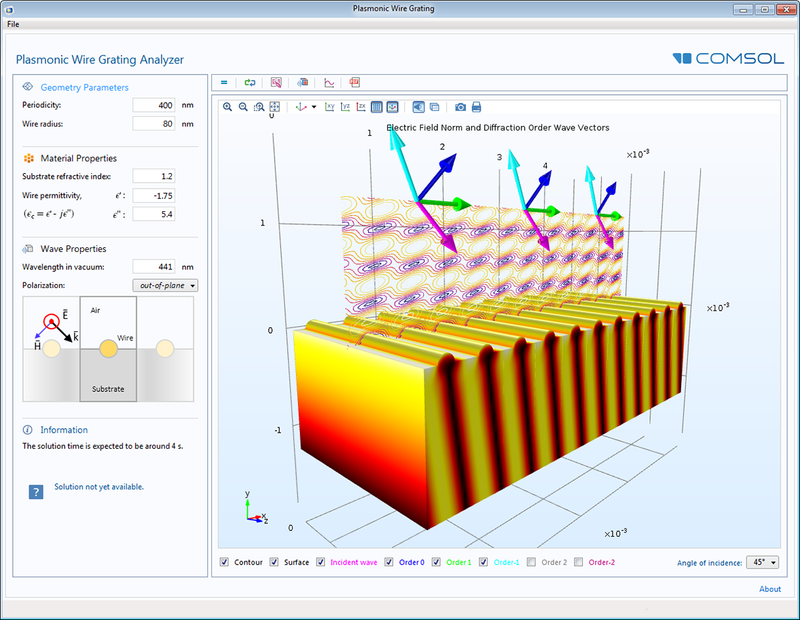 For users of the RF Module, COMSOL Multiphysics® version 5.2a brings new simulation methods for faster bandpass-filter type device design, new capability for modeling radar cross sections, and more. Review all of the RF Module updates in further detail below. Two powerful simulation methods have been implemented in existing Application Library examples for designing bandpass-filter type high-Q devices: the asymptotic waveform evaluation and frequency-domain modal methods. These perform simulations at speeds that are orders of magnitude faster than conventional frequency sweeping for these devices. 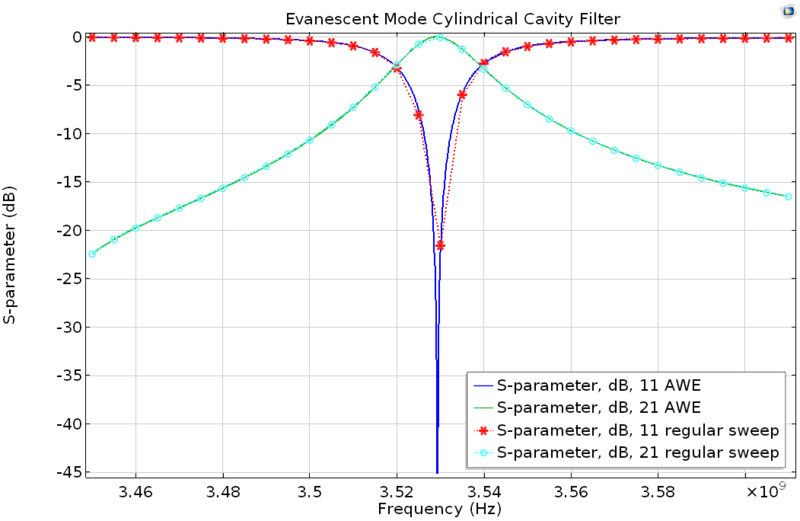 When simulating bandpass-filter type high-Q devices using the finite element method (FEM) in the frequency domain, you often encounter situations that require detailed frequency sweeps to describe the passband adequately and accurately. Simulation time is directly proportional to the number of frequencies included during the simulation sweep. These new methods substantially reduce the computational time. Comparison of an S-parameter analysis using the asymptotic waveform evaluation (AWE) and the regular FEM frequency sweep methods. The AWE method is about 50 times faster in this example. Postprocessing variables have been added to the physics interfaces that calculate bistatic radar cross sections (RCS). These postprocessing variables can be used in far-field plots to visualize the size of a scatterer as seen by a radar. The bistatic RCS variable, bRCS3D, describes the RCS measured through a transmitter and receiver that are located separately, and you can also plot monostatic RCS. For 2D models, you can model the bistatic RCS per unit length using the operator bRCS2D. 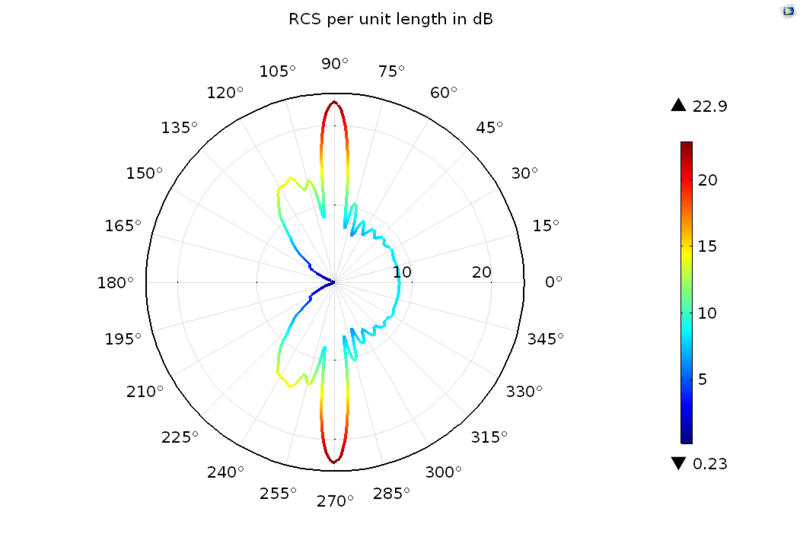 Monostatic radar cross section (RCS) per unit length visualized using a general extrusion operator and the bistatic RCS per unit length variable (bRCS2D). The Two-Port Network feature characterizes the response of a two-port network system, such as reflection and transmission, using S-parameters. 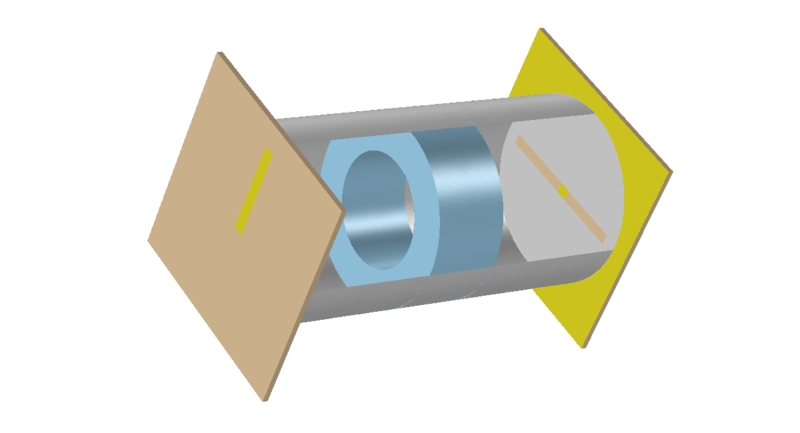 Just like the Lumped Port feature, the Two-port Network feature can only be applied on boundaries that extend between two metallic boundaries where the Perfect Electric Conductor, Impedance Boundary, or Transition Boundary conditions apply, which are separated by a distance much smaller than the wavelength. 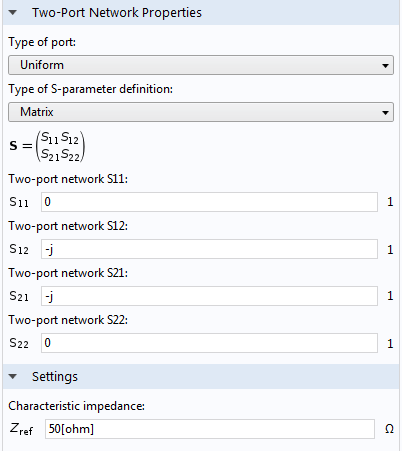 A pair of Two-Port Network Port subnodes are added by default to the Two-Port Network node and are used to select boundaries corresponding to Port 1 and Port 2 in the S-parameter input, respectively. 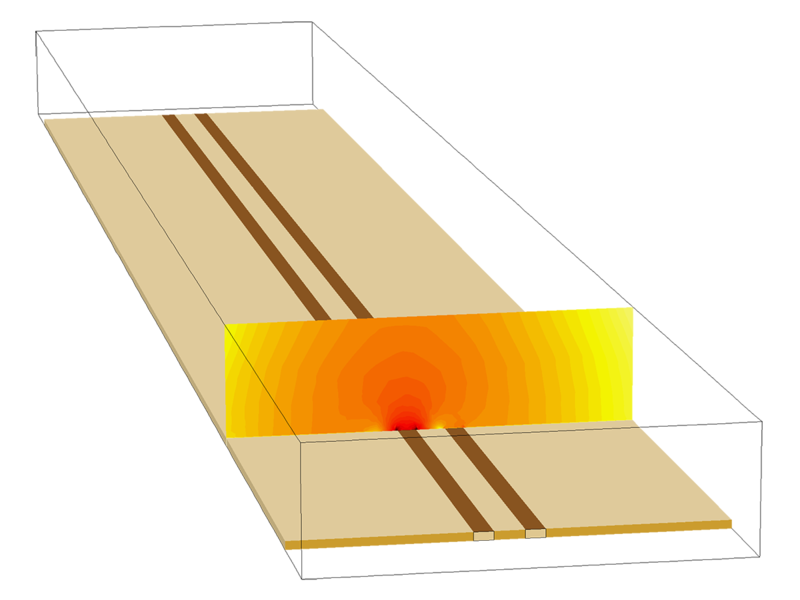 The Plasmonic Wire Grating Analyzer app computes diffraction efficiencies for the transmitted and reflected waves and the first and second diffraction orders for a wire grating on a dielectric substrate. The wavelength, polarization, material properties, wave periodicity, and radius can be changed. 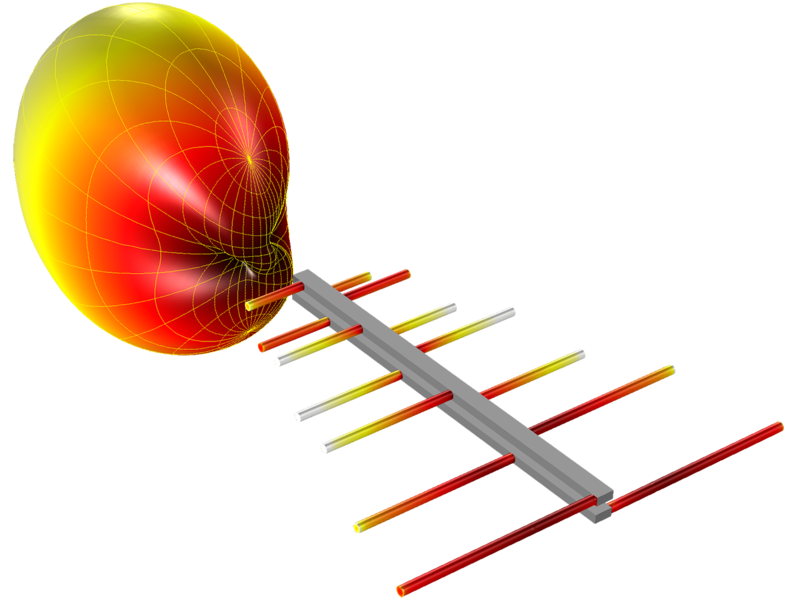 A log-periodic antenna is modeled by fitting a coplanar dipole array through two metallic body frames. The far-field radiation pattern and the norm of electric field on a coplanar dipole array are visualized. A microstrip line crosstalk model is composed of a microwave substrate, with a ground plane and two adjacent microstrip lines. The contour plot of the logarithmic norm of electric field shows the coupling of the electric field between the two microstrip lines.